Single conductors are necessary for efficient use in switch cabinets wiring or cable assemblies. If PVC, Silicone, Fluorinated polymeric or Rubber insulated, with plain or tinned copper conductors, European has an extended stock with nearly all popular color combinations. We produce special color combinations upon request. For all two or three coloured combinations please take our program for vehicle cables. 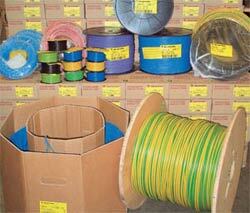 The dispatching is effected in cardboard boxes, coils, non-returnable reels or in cardboard barrels. Several sizes of reels or barrels are available.